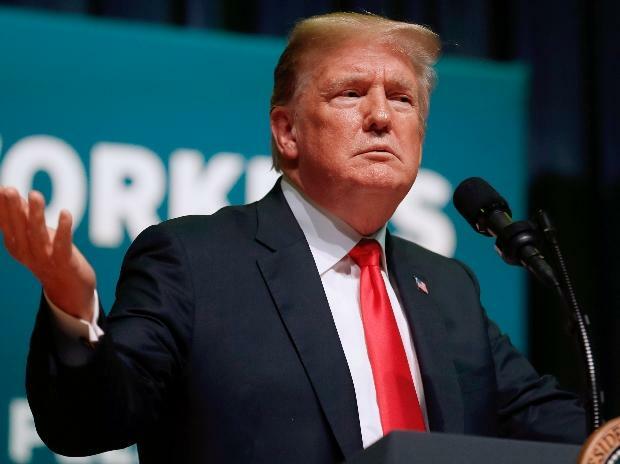 The US wants a "great relationship" with Pakistan but cannot do so as the country "houses enemies", President Donald Trump has said in his first comments in 2019 on America's strained ties with Islamabad, months after he stopped $ 1.3 billion in military aid to its former ally. Speaking to his Cabinet colleagues on Wednesday, President Trump, however, said a meeting with the new leadership in Pakistan under Prime Minister Imran Khan will take place "very soon". He said his administration has initiated peace talks with the Taliban in war-torn Afghanistan. Trump also told his Cabinet colleagues that he has ended $1.3 billion in aid to Pakistan because "this South Asian country houses enemies". "We want to have a great relationship with Pakistan, but they house the enemy. They take care of the enemy. We just can't do that," Trump said. "So, I look forward to meeting with the new leadership in Pakistan. We will be doing that in the not too distant future. But I ended $1.3 billion that we paid. I think it was water, we were just paying to Pakistan. So, I ended that," he said. Trump also alleged that Pakistan had not been fair to the United States. In November last year, Trump defended his administration's decision to stop hundreds of millions of dollars in military aid to Pakistan, saying Islamabad does not do "a damn thing" for the US and its government helped late al-Qaeda leader Osama bin Laden hide near its garrison city of Rawalpindi. "We give Pakistan $1.3 billion a year... (Laden] lived in Pakistan, we're supporting Pakistan, we're giving them USD 1.3 billion a year - which we don't give them anymore, by the way, I ended it because they don't do anything for us, they don't do a damn thing for us," he had said. Earlier, South Carolina Senator Lindsay Graham, who is considered close to President Trump, told CNN in an interview that if Pakistan helped the US in bringing the Taliban to the table for negotiations, the US would focus on counterterrorism and the ISIS. The Republican Senator wants the US to offer Pakistan a free trade agreement as an incentive to push the Taliban to the peace table to end the Afghan war. Prime Minister Khan was sworn in as Pakistan's Prime Minister in August last year. The cricketer-turned-politician said in January last year that meeting President Trump would be a "bitter pill" to swallow. Just a month ago, Trump wrote a letter to Khan, seeking Pakistan's help with stuttering Afghan peace talks and support in bringing the Taliban to the negotiating table to end the 17-year brutal war in the neighbouring country. Secretary of State Mike Pompeo met Prime Minister Khan in Islamabad in September last year and pressed him to take "sustained and decisive measures" against terrorists threatening the regional peace and stability. The relations between Pakistan and the US nosedived last year in January after President Trump accused Islamabad of giving nothing to Washington but "lies and deceit" and providing "safe haven" to terrorists. The US has repeatedly said that Pakistan was providing safe havens to the Afghan Taliban and the Haqqani network militants to attack US soldiers in Afghanistan. The US Congress also passed a bill to slash Pakistan's defence aid to $ 150 million, significantly below the historic level of more than $ one billion per year. The Trump administration announced early last year that it was suspending security assistance to Pakistan over differences on Afghanistan but indicated that training programmes for military officers will continue.